Semistructured data is used in data exchange applications, like B2B and EAI, and represents data in a flexible format. Every data item has a unique tag (also called label), and data items can be nested. Formally, a semistructured data instance is a tree whose nodes are labeled with tags and leaves are labeled with data values. XML [Con98] is a standard syntax for describing such trees; Fig. 1 shows a tree representing a semistructured data instance and its XML syntax. We will refer interchangeably to semistructured data instances as trees or XML trees. A. Bruggemann-Klein, M. Murata, and D. Wood. Regular tree languages over non-ranked alphabets, 1998. Available at ftp://ftp11.informatik.tu-muenchen.de/pub/misc/caterpillars/. D. Beech, S. Lawrence, M. Maloney, N. Mendelsohn, and H. Thompson. Xml schema part 1: Structures, May 1999. http://www.w3.org/TR/xmlschema-1/. World Wide Web Consortium. Extensible markup language (xml) 1.0, 1998. http://www.w3.org/TR/REC-xml. P. Fankhauser, M. Fernandez, A. Malhotra, M. Rys, J. Simeon, and P. Wadler. XQuery 1.0 formal semantics, 2001. available from the W3C, http://www.w3.org/TR/query-semantics. Haruo Hosoya and Benjamin C. Pierce. XDuce: An XML processing language (preliminary report). 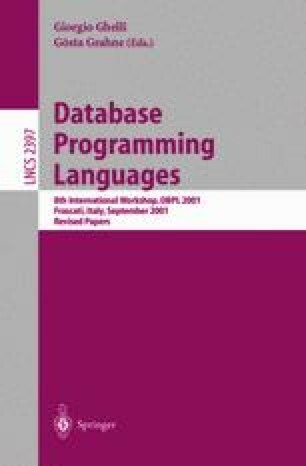 In WebDB’2000, pages 226–244, 2000. http://www.research.att.com/conf/webdb2000/.